Treb's Blog Stop: Congratulations Lori! Lori Coryell got married Saturday to a guy named John Bynum. 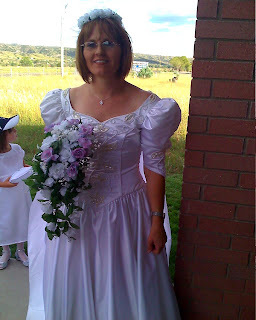 Patti and I were privileged to go to the wedding and reception in Mimbres. The reception was at Camp Thunderbird between Mimbres and Lake Roberts. I haven't been out there since we had a family reunion with the Ridling Clan. The main hall seemed larger then. Camp Thunderbird was built over the period of 8 years by 1400 boyscouts from 1947-1955. It's a cool rustic looking place, and makes a great location for weddings and reunioins. We all had a good time. My Posts are like 4 funerals and a wedding... Or was it the other way around?